Sojourner Truth, abolitionist, feminist, evangelist and women’s rights activist, was born into slavery as Isabella Baumfree in upstate New York around the year 1797. Blessed with a powerful voice, inspired by religious conviction, and standing almost six-feet tall, Truth used an aggressive platform style of engaging her audiences that attributed to her personal charisma. Legend has it that Truth would bare her breasts before crude audiences who challenged her womanhood. Harriet Beecher Stowe once said that she had never met anyone who had more of a subtle and powerful presence than Sojourner Truth. The state of New York began emancipating all slaves on July 4, 1827. However, Sojourner Truth didn’t wait for her freedom to be granted. In late 1826, Truth escaped to freedom with her infant daughter, Sophia, while her other children stayed behind. After her escape, Truth learned that her five-year-old son Peter had been illegally sold to a man in Alabama. She eventually took the issue to court and won the case. The trial was one of the first cases in the United States in which a black woman successfully challenged a white man in a court of law. In 1844, Truth joined forces with notable abolitionists Frederick Douglass, William Lloyd Garrison and David Ruggles at the Northampton Association of Education and Industry in Northampton, Massachusetts. The members of the Association lived together on 500 acres as a self-sufficient community and supported a broad agenda that also included women’s rights and pacifism. The Northampton community disbanded in 1846, but the legend of Sojourner Truth was just beginning. 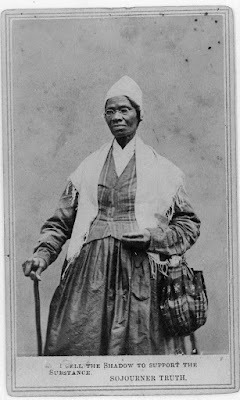 In 1850 her memoirs were published under the title of The Narrative of Sojourner Truth: A Northern Slave. William Lloyd Garrison wrote the book’s preface and Truth’s friend, Olive Gilbert, dictated her recollections because Truth could not read or write. After Truth spoke at the first National Women’s Rights Convention in Worcester, Massachusetts, she began touring the country, speaking to large audiences about slavery and human rights. In May of 1851, Truth delivered her most famous speech at the Ohio Women’s Rights Convention, a speech that would later be known as “Ain’t I a Woman?” The original version of the speech that was published in the Ohio newspaper The Anti-Slavery Bugle did not contain the phrase at all. The phrase would not appear in print until 12 years later, when a “southern-tinged” version of the speech was reprinted. Truth toured Ohio from 1851 to 1853 and as her notoriety grew, the abolitionist movement grew with it. Even among fellow abolitionists, Truth’s positions were considered radical. Sojourner Truth was sagacious and outspoken, she sought political equality for all women and chastised the abolitionist community for not actively seeking civil rights for black women as well as men. Truth was also a staunch advocate for prison reform and the elimination of capital punishment. She eventually settled in Michigan where she would testify before the Michigan legislature as an opponent of capital punishment. During the Civil War, Truth recruited troops for the Union Army, collected food and clothing for black regiments, and met with President Abraham Lincoln, who gave her permission to become a counselor at Freedman’s Village. After the Civil War, Truth immersed herself in securing land for ex-slaves during Reconstruction and dictated many letters, which would later provide pivotal details about Reconstruction. Sojourner Truth died at her home in Battle Creek, Michigan on November 26, 1883. Embraced by a community of reformers including Amy Post, Wendell Phillips, Lucretia Mott, and Susan B. Anthony, her funeral and burial in Battle Creek was the largest the town had ever seen at the time. That her journey began as an 11-year-old slave who was sold for a flock of sheep and $100, and her life was commemorated with an unveiled statue at the U.S. Capitol in 2009, is a testament to her character and her place in the history of the United States. Sojourner Truth was the personified confluence of women’s rights, civil rights, prison reform, property rights, and universal suffrage. She is one of the most remarkable people this country has ever known. Philip Bouie is the Development Officer for Legal Voice. He is steadfast in his commitment to women’s rights, marginalized communities and eating desert on a daily basis. He’s also black like Sojourner Truth.